"A delicious baked chicken. This is excellent to double or triple and serve to a large crowd. I have also used thighs instead of breast meat. This dish is low in fat, but high in taste!" 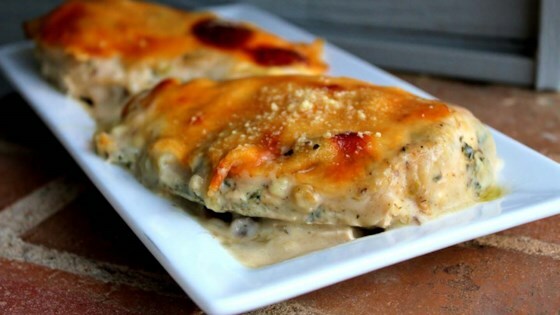 Place chicken breasts in a 9x13 inch baking dish, in a single layer. Cover with the celery soup and bake uncovered in the preheated oven for 40 minutes. Turn chicken pieces over and bake for another 30 minutes, until browned. Remove from oven. Combine the mushroom soup, water, onion, garlic and oregano and mix all together. Pour mixture over chicken. Top with mozzarella cheese slices, pushing the cheese down into the sauce. Sprinkle grated Parmesan cheese on top and bake in the preheated oven for 20 minutes more until bubbly and golden brown.